Arise MG has joined arms with Hidden Treasure - A ministry initiated by the Women's Department of the Baptist Union of South Africa. 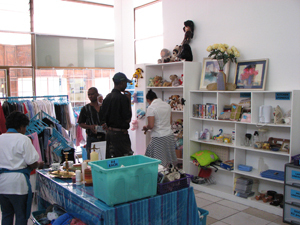 A charity shop was opened in Alberton (near the home affairs) in October 2009. Items are donated by interested and caring people and sold to the public. Practically anything is accepted for sale. Profits are then used to support widows and orphans. At times, however, relevant goods are distributed direct to the poor and disadvantaged. For example extra clothing and other items, as needed, are used to clothe the children and needy at the project in Emmaus, KZN (See Emmaus project). After covering initial costs, rent (graciously given to us at a reduced rate), and retaining two months running expenses, the shop is now making a profit. Currently the money is being used to feed the children daily at the play centre in Emmaus and care for their needs, as well as to pay the wages of the staff taking care of the children. More than this, people coming to the shop are ministered to as we treat them courteously – with respect and dignity – and demonstrate to them the love and grace of our Lord Jesus Christ. Some ask for prayer and we try to help the poor in various ways. The people of the area have told us how they love the shop as it helps them so much and we have built up lovely friendships with many of our regular customers. We are grateful to God and the generous people who have donated, and continue to donate, to the shop. And especially to the Rossettenville Baptist Church with whom we partner, and who have the shop on their hearts. They have given so much and work so hard to make it a success. Donate your excess / unwanted goods to a worthy cause. What do we sell at our Hidden Treasure shops? All used and sometimes new, household goods: furniture, linen, ornaments, paintings, kitchenware, electrical appliances, cutlery and crockery, pots and pans, clothing, jewelry, cosmetics, shoes, hats, tools, toys, games, cd's, dvd's, videos, books and magazines, sporting equipment, stationary... everything and anything!! If you are interested in donating anything, please contact Carmen (See contact details below) or visit our shop. VOLUNTEERS, MEN AND WOMEN, OF ALL AGES ARE ESSENTIAL! Each shop has an employed manageress, but can only run effectively with the assistance of volunteers, each willing to work one, four hour shift per week morning or afternoon. Our volunteers are on the front line helping to process stock and serve customers - their support is priceless. They form the backbone of our ministry, involving their families and friends, encouraging the support of their churches. If you have time that you are willing to give to a worthy cause, we would love to hear from you! By joining our team, you will learn new skills. Your training and experience will be a tremendous asset to us. Whatever your interest, be that antiques, books, art or interacting with people, there will be a role to best suit you. Your gift of time, skills and experience will be put to good use! THERE IS NEVER A DULL MOMENT!! Unpacking boxes, cleaning, sweeping, ironing, unloading vehicles and carrying furniture. Hard work yes, but oh, so rewarding! At Hidden Treasure, we are always on the look out for those with a sound knowledge of collectables, music, jewelry, books, vintage clothing, textiles, photography or stamps and coins. We must make sure we never overlook a 'hidden treasure'. We welcome those who specialize in these items, using your knowledge to accurately price and display our goods. Your experience is our map to the 'hidden treasure'. Unrivalled camaraderie as part of a great team. Use your skills for a worthy cause. Develop existing skills and learn new ones. Receive the training you need to carry out your duties. Believers of all ages are working together; mentoring takes place. Believers of different denominations are sharing a common goal. Believers of different cultures build friendships as they work together. Networking takes place between churches. People are grateful to have an honest outlet for their generosity. They feel confident to give, knowing where the money is going. If you are interested in volunteering, in any way, please contact Donald (See contact details below). And all those who had believed were together and had all things in common; and they began selling their property and possessions and were sharing them with all, as anyone might have need.